Hamas Tell’s Brazil’s President What He Can And Cannot Do? Palestinian organization Hamas, which controls the Gaza Strip, has condemned President Jair Bolsonaro’s visit to Israel. By way of note, Hamas said that Bolsonaro’s trip, which announced the opening of a business office in Jerusalem and visited the Wailing Wall alongside Prime Minister Benjamin Netanyahu, violates international law and represents a contradiction in attitude history of Brazil for the Palestinian cause. APRIL 1, 2019 AT 3:16 P.M.
247 – The Palestinian organization Hamas, which controls the Gaza Strip, condemned President Jair Bolsonaro’s visit to Israel. By way of note, Hamas said that Bolsonaro’s trip, which announced the opening of a business office in Jerusalem and visited the Wailing Wall alongside Prime Minister Benjamin Netanyahu, violates international law and represents a contradiction in attitude of Brazil for the Palestinian cause. During his visit to Israel, Bolsonaro was the first head of state to break the protocol by going to the Wailing Wall accompanied by the Israeli prime minister. Not even the president of the United States, Donald Trump, a close ally of Israel and of whom Bolsonaro is a self-confessed admirer, practiced such an act. 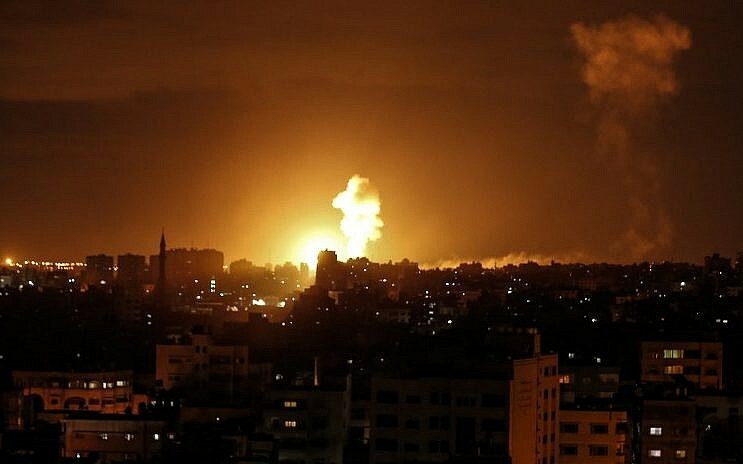 Islamic Jihad announced Saturday it had agreed to an Egyptian-brokered ceasefire to end an escalating exchange of fire with Israel, as Israeli jets struck sites in the Gaza Strip belonging to the Palestinian terror organization. A spokesman for the group told the Gaza-based Safa news site that a ceasefire agreement went into effect following Egyptian communication with its leadership. He said Islamic Jihad would remain committed to the ceasefire as long as Israel did likewise. There was no immediate acknowledgement of the ceasefire declaration in Israel, which in the past has denied proclamations by Gaza-based terror groups regarding understandings to end fighting. 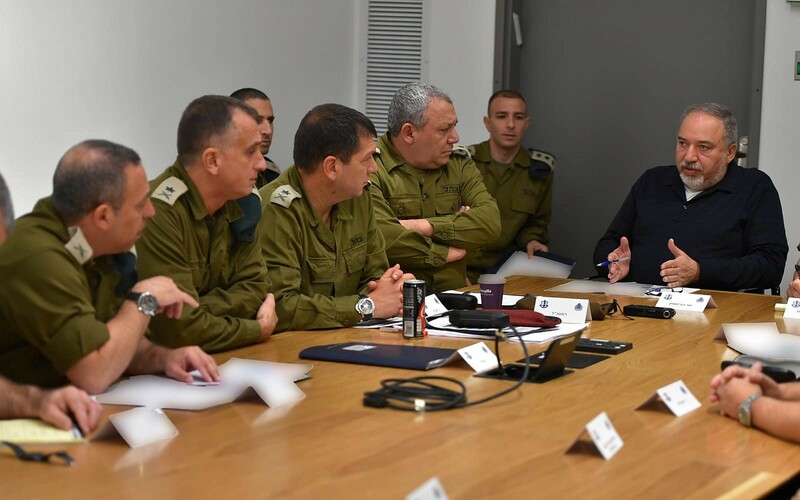 Defense Minister Avigdor Liberman was meeting with IDF Chief of Staff Gadi Eisenkot and other top security officials at the time of the announcement. A few hours after Islamic Jihad announced the ceasefire, the Eshkol Regional Council lifted orders that residents must remain in close proximity to bomb shelters. Restrictions remained in place, however, limiting gatherings outdoors to 100 people and those indoors to 500. The declaration by Islamic Jihad to end the rocket fire came as the Israel Defense Forces said fighter jets struck eight targets tied to the Iran-backed terror group in three separate military facilities after Israel was hit by salvos of rockets from Gaza overnight and on Saturday morning. The Gaza targets included weapons production sites and a factory that makes parts for subterranean tunnels, the army said, adding that the later was near a school. The top IDF spokesperson earlier blamed Iran and Syria for the Islamic Jihad rocket attacks. 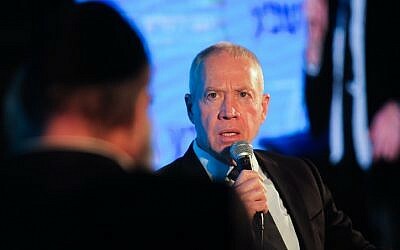 Though he did not accuse Hamas of taking part in the launches, Brig. Gen. Ronen Manelis reiterated that Israel considers the terror group responsible as Gaza’s rulers. Another IDF spokesman, Lt. Col. Jonathan Conricus, said the rocket strikes were ordered by operatives from the overseas branch of Iran’s elite Islamic Revolutionary Guard Corps stationed in Syria and warned Israel may not limit its response to Gaza. 1. This Palestinian Islamic Jihad cement factory, which was used to build cross-border terror tunnels, was built RIGHT NEXT TO a #school, putting the children of #Gaza at risk. 34 rockets were fired at Israel overnight and Saturday morning, according to the IDF, 13 of which were intercepted by the Iron Dome anti-missile system. Two of the rockets fell in Gaza and the rest landed in open areas. The Defense Ministry’s liaison to the Palestinians said a mortar launched during the barrages struck the ambulance terminal at the Erez border crossing, the sole pedestrian passage between Gaza and Israel. In response to the rocket fire, Israeli aircraft and attack helicopters attacked 95 targets in Gaza belonging to Hamas and Islamic Jihad. The army said the targets included military and weapons manufacturing facilities through the Strip, a factory in Khan Younis producing cement used in subterranean tunnels and a four-story building in Gaza City headquartering Hamas security services. Palestinian sources speaking to the Ynet news website claimed the attacks were carried out against the objections of the Hamas terror group that rules Gaza, though this had no official confirmation. Israel views Hamas as ultimately responsible for any attacks emanating from the territory it controls, regardless of the source. In response to the rocket barrages, the IDF’s Home Front Command overnight issued instructions restricting gatherings in the Gaza periphery: up to 100 people in open areas and 500 people in closed spaces. 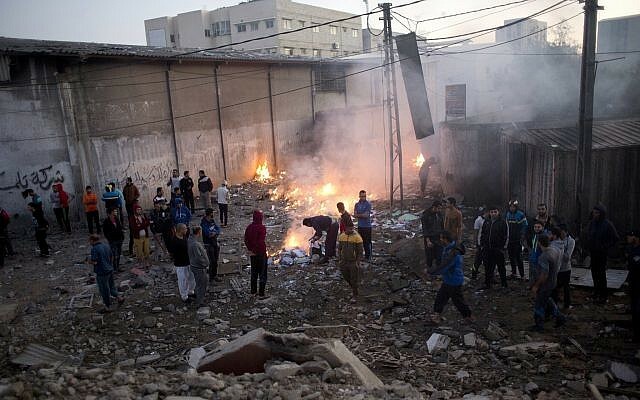 The rocket fire comes amid a deadly flareup in violence in the Gaza Strip. Earlier on Friday, thousands of Palestinians gathered at five locations along the border, burning tires and throwing rocks and firebombs at Israeli troops who responded with tear gas and occasional live fire. Five protesters were killed and another 170 were injured in the clashes with IDF troops, the Hamas-run health ministry in Gaza said. One of those killed was blown up by his own hand grenade, which exploded prematurely, witnesses said. Earlier this week, a rocket was launched at southern Israel from Gaza, triggering sirens in a number of communities in the Eshkol region, ending a week-long stretch of relative calm in the coastal enclave. 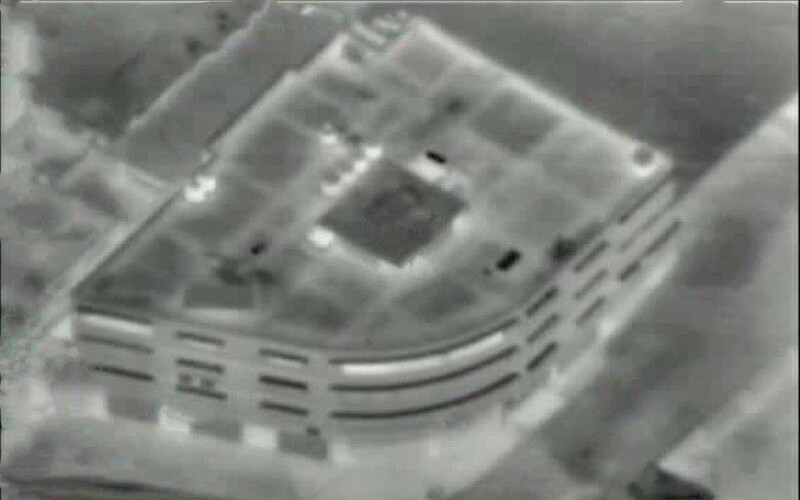 In response to that attack, the IDF said it hit eight Hamas targets in the Gaza Strip, including training bases and a weapons production facility. The ramped up tensions are likely to complicate the mission of Egyptian mediators, who have intensified their shuttle diplomacy to achieve calm and prevent a full-blown conflict between Gaza’s Hamas rulers and Israel. These demonstrations take place each Friday, regularly sending massive amounts of thick smoke into the Israeli communities nearby, as Palestinians burn tires along the border and send incendiary devices affixed to balloons into Israel to spark fires. The period since March 30 has also included a number of significant flareups and extended clashes. Another rocket launched from the Gaza Strip last week struck a home in the southern Israeli city of Beersheba, causing significant damage, but no injuries as the family inside had reached their bomb shelter in time. In recent weeks, the situation along the border has grown more precarious, as indirect negotiations between Israel and Hamas — with the Egyptian military and United Nations acting as intermediaries — have reached a critical turning point. Israel has called for a cessation to all violence, including both the clashes on the border and the daily arson attacks that have burned large swaths of land in the south, in exchange for certain economic incentives and an easing of the blockade around the coastal enclave, which is imposed by Israel to prevent Hamas importing weapons. At least 160 Palestinians have been killed and thousands more have been injured in the clashes with IDF troops, according to AP figures. Hamas, an Islamist terror group that seized control of the Strip in 2007 and seeks to destroy Israel, has acknowledged that dozens of the dead were its members. One Israeli soldier was shot dead by a sniper on the border. The Associated Press and Adam Rasgon contributed to this report. 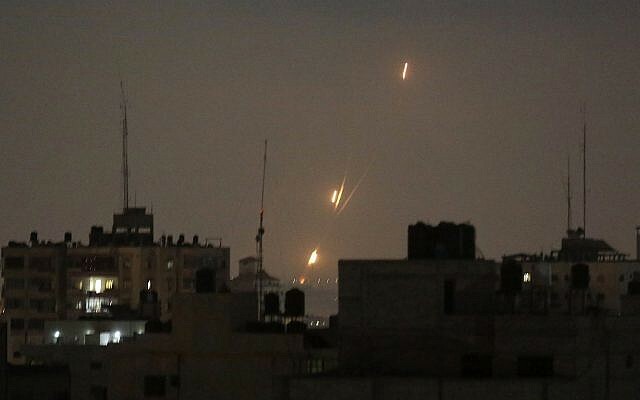 Yesterday one of Hamas’s rockets that they tend to fire off into Israel daily hit an Israeli home and last night Israeli jets struck several Hamas targets in the Conclave. Israel said that one Palestinian was killed and seven wounded in Israel’s return fire. Hamas says that about 25 were killed and another fifty or so were wounded, and of course Hamas says that a great number of the dead were children on their way to school. Every day since March 30th of this year Hamas has staged a violent confrontation at the Border Fence with Israel during their so call march of return. For the past several months these demonstrators have been sending kite bombs into Israel in an attempt to kill and destroy. If any Nation on earth was having to put up with this on their borders any Nation would have long ago reacted violently and decisively against these act of war that Hamas has been guilty of purporting, yet for the sake of the innocent civilians inside the Conclave Israel has stayed their hand. After Israel struck back at Hamas targets yesterday the leaders of Hamas said that Israel was trying to destroy the current truce. To that I say, truce, what truce? Hamas has been breaking that “truce” everyday for at least the past seven months. So I guess what Hamas means by that is a one-sided truce, one where Hamas commits acts of war everyday but where Israel does nothing about it. 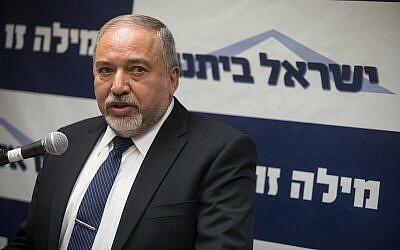 Now, to the point of my article to you today on why I say that Mr. Liberman has it wrong about how Israel must address Hamas from this point forward. For more than a decade now since the Israeli government gave the Gaza Strip back to the Palestinian people and to a little bit lesser of an extent the West Bank also, these lands have been used for staging grounds for attacks on the people of Israel. Israel gave this land to the Palestinian people in what was supposed to be a “land for peace deal” yet since doing so there has been no peace and the hate groups like Hamas that reside within those lands vow that there will never be any peace with Israel until there is no such thing as a Nation of Israel. In my opinion, Israel must make it very plain to all of the people of the Gaza Strip that all hostilities toward Israel must stop at once. Reality is that the people within the Conclave, even if they themselves do want to have peace and much more freedom, they know that these hate groups will never allow peace. So, Israel must tell everyone in the Gaza Strip that it is up to them if they want to live in peace and the only way to have peace is if every member of Hamas and all of the other terrorist groups are killed by the citizens of the Strip. It is easy to say that this will never ever happen and I know of only one way where my idea could work. That idea is simple, Israel must let the citizens of the Strip know as an absolute fact that if the violence does not stop at once that when Israel is forced to attack Hamas again that Israel is going to make every possible effort to kill every member of every terrorist group. Reality is that in doing so that hundreds of thousands of civilians may well be killed also. In other words, if the people of the Strip do not quickly kill all members of these terrorist groups themselves, the Strip is going to be scorched! Israel will not allow any more fuel into the Gaza Strip until violence against Israel from the Hamas-run enclave halts “entirely,” Defense Minister Avigdor Liberman said Saturday. 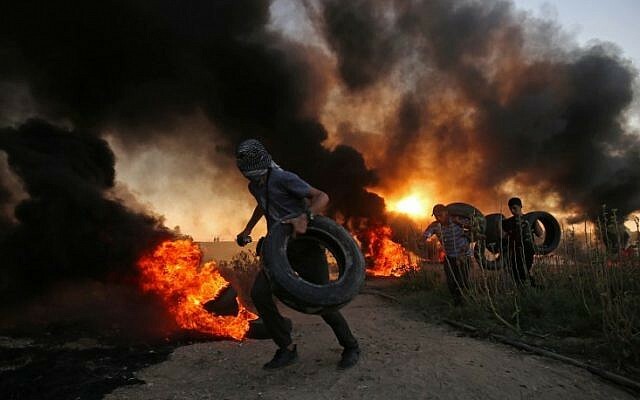 “Until violence in the Gaza Strip stops entirely, including the launching of incendiary balloons and the burning of tires near Israeli communities, the supply of fuel and gas to the Gaza Strip will not be renewed,” he said. On Saturday afternoon two Palestinians breached the border in the north of the Strip and hurled an object at an unmanned IDF post. They then returned to Gaza. Security forces arrived at the scene to inspect the suspicious object. Later in the evening the army said a number of attempts to breach the security fence were identified, some of them successful. “In all of the events, the suspects were under surveillance from the moment of the crossing and returned to the Gaza Strip immediately,” the military said. Since the morning, firefighters worked to extinguish four blazes caused by incendiary balloons near Israeli towns in the Gaza periphery, a spokesman for the Israeli Fire and Rescue Services said. One flaming balloon landed near a grocery store in Kibbutz Givat Brenner, near Rehovot. A civilian found the balloon and extinguished it. Police were called to the scene. 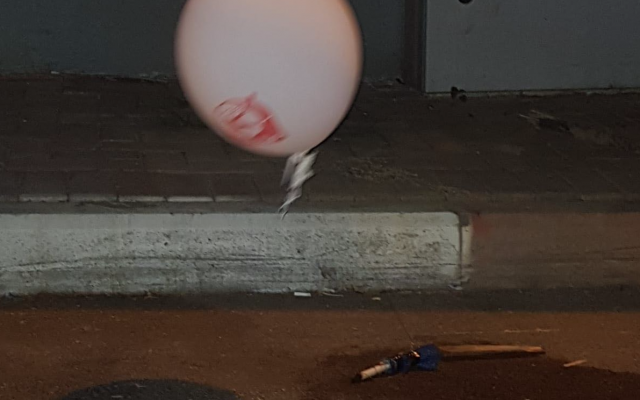 Police, meanwhile, said four such balloons discovered in recent days in the central towns of Rishon Lezion, Bat Yam, and Modiin had all probably come from Gaza, according to the Walla news site. Police sappers who examined the balloons found the incendiary devices they carried identical to those used in Gaza. Police noted that the distance between Gaza and the cities in question was not great, and said balloons could easily cross such distances on air currents. Seven Palestinians were reported killed in intense clashes with Israeli security forces along the Gaza border Friday afternoon, according to the Hamas-run health ministry. Gaza media outlets said at least 150 protesters were injured. In the most serious incident, the army said assailants planted a bomb at the fence in the south of the Strip, blowing a hole in it. Some 20 Gazans then infiltrated the border and approached an IDF snipers’ post. Most turned back, but three who did not were shot and killed, the IDF said. Liberman’s order to halt the transfer of fuel into the Gaza Strip in response to the incident came only days after Israel began allowing fuel donated by Qatar to be pumped into the Strip to allow increased power for residents. “Israel will not tolerate a situation in which fuel is allowed into Gaza while terror and violence is used against IDF soldiers and citizens,” a statement from his office said Friday. In recent days Qatari-bought fuel had begun entering the Strip to allow operation of its only power station, in a bid to alleviate conditions in the blockaded Palestinian enclave. Hundreds of liters of fuel have since passed into the territory. Israel facilitated the delivery over the objections of the Palestinian Authority, hoping it would help ease months of protests and clashes. For months residents of the strip have been receiving only four hours of electricity a day on average. Jamie McGoldrick, the UN’s resident humanitarian coordinator, told the Reuters news agency the delivery will add a few more hours of electricity to Gaza’s 2 million residents. Hamas seized control of Gaza from Abbas’s Palestinian Authority in a 2007 near civil war and multiple reconciliation attempts aimed at restoring the PA to power in Gaza have failed. Abbas says that making deals with Hamas amounts to recognizing their control over Gaza in place of the PA and has sought to block the fuel deliveries. 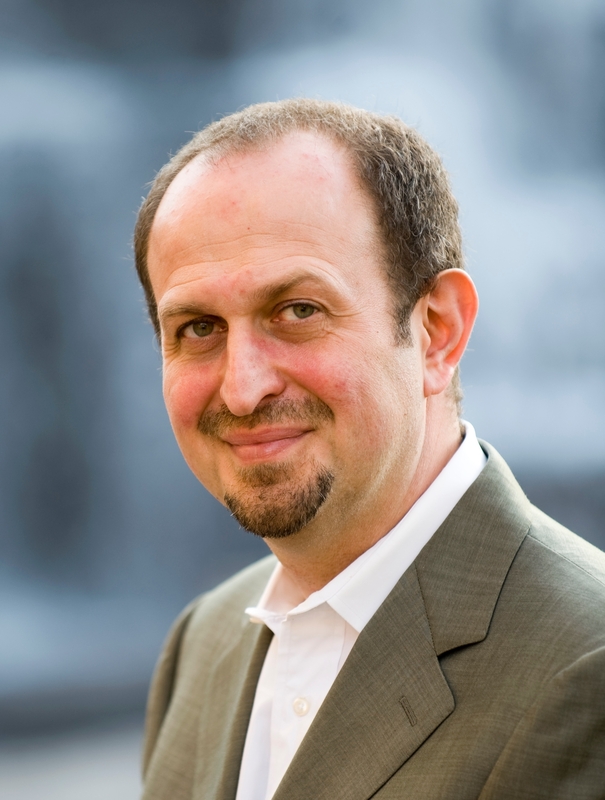 He has reportedly threatened to cut off funds to Gaza in response to the fuel transfers. Israel fears further deterioration in Gaza could lead to another round of war on the southern border. Both Israel and Egypt enforce restrictions on the movement of people and goods into and out of Gaza. Israel says the blockade is necessary to keep Hamas and other terror groups in the Strip from arming or building military infrastructure. Editor’s Note:Through President Trump’s announcement that his administration would no longer fund UNRWA, America has further written itself out of the process of peacemaking in the Middle East, argues Hady Amr. Trump has sent an unmistakable message to the Palestinian people: He callously disregards their most basic needs. This post is adapted from a piece originally published on The Hill. As if to boast, in a call to mark the Jewish New Year, President Trump told American Jewish leaders: “I stopped massive amounts of money that we were paying to the Palestinians.” Trump added he told the Palestinians, “We’re not paying until you make a deal.” On the face of it, such an approach may seem like a typical Trump negotiating tactic, but the decision is so misguided that in addition to having dire immediate consequences, it will haunt the United States for years to come. Trump was referring to the State Department’s recent abrupt announcement that his administration would no longer fund the United Nations Relief and Works Agency for Palestine Refugees (UNRWA), reversing a policy of support by every American president—Republican and Democrat—since it was created about 70 years ago as a cornerstone of America’s support for stability in the Middle East and flagship of our values to provide for the most vulnerable. Indeed, UNRWA is so in-sync with our values that American citizens voluntarily give millions of dollars, collectively, to UNRWA each year via U.S. 501c(3) organizations—more than some whole countries. But should we really be surprised? We already know that Trump’s actions have been antithetical to refugees at home and abroad, and we also know that in a global economy of over $100 trillion dollars, a meager $300 million cut by the United States should be able to be covered by another country. That’s true on both counts, but in that truth lies the problem: the problem for America, for Palestinians, and even for Israelis. What is also true is that Trump’s action is based on such a fundamentally flawed misunderstanding of the situation that it may have the opposite of its intended effect. But before we get to that, let’s look at the immediate impact: UNRWA, which provides vital life-saving services, health care and education to stateless refugees in the Middle East, is now scrambling for funds. These funds go toward a modern, secular education for 500,000 boys and girls; vaccinations and health clinics that provide services to over three million refugees and a basic level of dignity for millions who otherwise would lead lives of despair. While some donors like Canada, Qatar, Saudi Arabia, and the United Arab Emirates are stepping in to offset part of what the United States is cutting, UNRWA will still likely have to reduce services. Those service reductions hurt people who are not even citizens of any nation. So when UNRWA cuts back services in the impoverished refugee camps in Lebanon, Jordan, Syria, the West Bank, and Gaza, what forces on the ground will fill the void? Whoever it is, they are unlikely to be America’s friends. Even the Israeli military knows that cutting funding for basic services to refugees are a recipe for disaster for Israel. 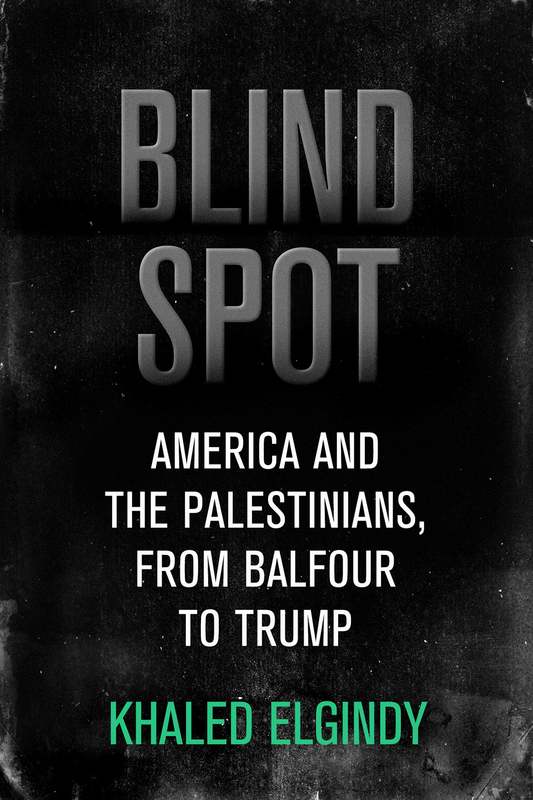 Nowhere are the UNRWA cuts more acute than in the Gaza Strip, where about two million souls inhabit a tiny area twice the size of Washington, DC that few can gain permission to leave. There, UNRWA provides services to 1.3 million people, spending about 40 percent of its overall budget. Roughly 262,000 boys and girls are enrolled in 267 UNRWA schools there. Twenty-two health clinics provide for millions of patient visits a year. It is unlikely that any agency could provide significantly better quality services for less cost. Through these moves, America has further written itself out of the process of peacemaking in the Middle East. Trump has sent an unmistakable message to the Palestinian people: He callously disregards their most basic needs. Trump has also sent that powerful message to their friends and allies across the Middle East and the rest of the world. Trump’s message will engender the opposite of goodwill and will further erode America’s moral leadership in the Middle East. Indeed, the long-term problem is more profound, and it’s essential to understand because the Trump administration seeks to redefine what it means to be a Palestinian refugee, which in turn could have implications for refugees worldwide. Underlying the Trump administration’s cuts to UNRWA is the false premise that Palestinian refugees derive their refugee status from UNRWA. They don’t. They derive it from international law. UNRWA’s role is simply to provide social services to these stateless refugees—not determine who is and who isn’t a refugee under international law. Also underlying Trump’s attack on UNRWA is the false premise that other refugee populations don’t transfer their refugee status to their children. Wrong again. International law conveys refugee status to children of other refugee populations until permanent homes can be found. People from Afghanistan, Bhutan, Burma, and Somalia are but a number of the populations where refugee status has been conveyed to descendants. Finally, underlying Trump’s decision is the false premise that cutting funds to UNRWA and to development projects in the West Bank and Gaza will somehow pressure the Palestinian Authority. Again, it won’t; others will fill the void. Anyhow, Trump is so unpopular in the West Bank and Gaza that any pressure he applies to the Palestinian leadership only makes them look stronger. At its core, the century-old Israeli-Palestinian conflict is about two fundamental things: land and people. In particular, it’s about which group of people gets to live on which part of the land. Although Jews and Arabs are about of equal number in the Holy Land, in the past decades, Israel has had full control of roughly 90 percent of the land. The Palestinians have significant—but not full—control of around 5 percent. And around 5 percent is shared control. What Trump’s actions seem to seek to achieve is to somehow convince the millions of Palestinian refugees to give up their deep and abiding emotional attachment to their homeland. Their homeland is the Holy Land, and their attachment to it won’t just vanish. Whatever final status agreement is one day achieved, Trump need look no further than the Jewish people’s 2,000-year longing to return to understand that a few meager decades will not diminish the longing of Palestinian refugees to return. Trump also need look no further than out his own window to the White House lawn, where in September 1993 an agreement was signed between Israeli and Palestinian leaders that many, including myself, passionately hoped would help channel Jewish and Palestinian mutual aspirations for peace, security, sovereignty and prosperity into a lasting agreement. Although those objectives have not yet been achieved, failing to recognize one group’s attachment to the land—or worse seeking to obliterate their emotional connection—will only serve the opposite of the cause of peace and profoundly damage America in the process. As with Trump’s withdrawal from the Paris Agreement, American redemption may require a reversal by a future president. Meanwhile, perhaps direct donations by U.S. citizens can help recuperate a shred of our American dignity when it comes to Mideast peacemaking. Hamas leader Yahya Sinwar on Wednesday said there was no concrete ceasefire agreement yet with Israel, but warned that if hostilities resume the terror group could launch hundreds of rockets deep into the Jewish state. Sinwar warned that if talks broke down Hamas would fire hundreds of rockets in Israel. “What the resistance launched in 51 days in the last war, it can launch in five minutes during any [future] Israel aggression,” he said, referring to the 2014 conflict. Indirect negotiations between Hamas and Israel have reportedly included discussion on easing the blockade, but by no means a complete lifting of it. Israel says the blockade is in place in order to prevent weapons and other military equipment from entering the Strip. Sinwar said that talks on a prisoner exchange were progressing on a separate track and were not connected to the ceasefire agreement. 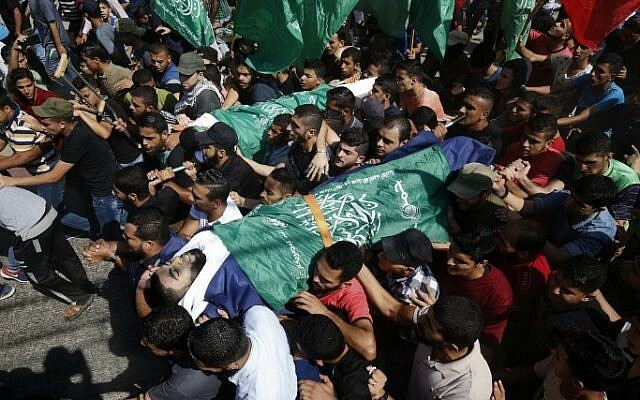 Hamas holds the bodies of two Israeli soldiers and two civilians. Israel has said in the past it would not ease the blockade until they are released. 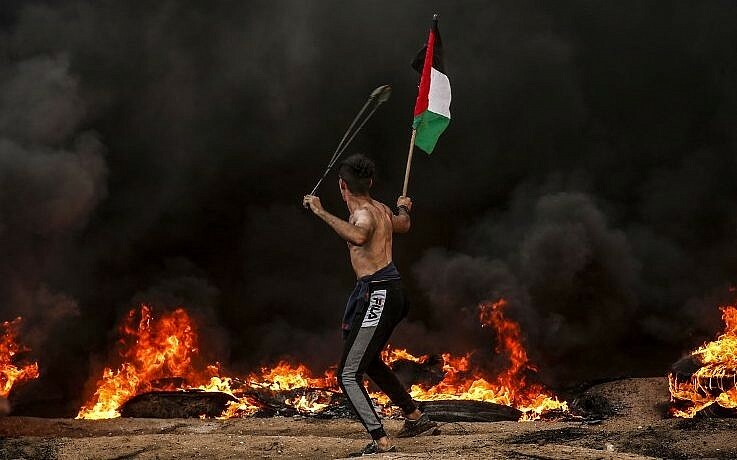 Recent months have seen repeated rounds of intense violence between Israel and Hamas, along with weekly border protests at the Gaza border that have regularly included rioting, attacks on Israeli troops and attempts to infiltrate and sabotage the border fence. Around 170 Palestinians have been killed by Israeli fire since the weekly protests began, a Hamas ministry says. Hamas has acknowledged that dozens of those killed were its members. In addition to the border clashes, southern Israel has experienced hundreds of fires as a result of incendiary kites and balloons flown over the border from Gaza. Over 7,000 acres of land have been burned, causing millions of shekels in damages, according to Israeli officials. Sinwar also warned the Palestinian Authority against taking steps to foil the nascent deal. “If the agreement is signed without the PA’s permission, it is illegal and constitutes treason,” Abbas said in private conversations, according to Hissein al-Sheikh, a senior member of Abbas’s Fatah party. “Over my dead body will there be a ceasefire and calm between both sides,” Abbas said, according to al-Sheikh. 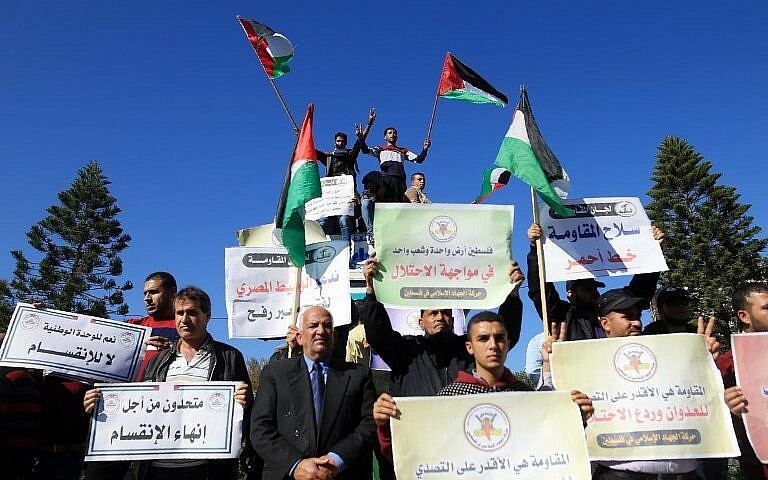 Abbas’s Fatah party and Hamas have been deeply divided for more than a decade. Hamas, an Islamist terror group which openly seeks to destroy Israel, seized control of Gaza from the Fatah-dominated Palestinian Authority in 2007 and several attempts at reconciliation since then have failed. 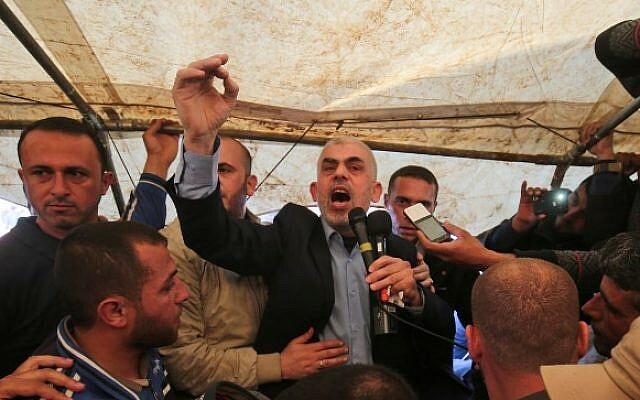 The PA government has been putting pressure on Hamas to reach a reconciliation deal that would return Fatah rule to Gaza, and earlier this year began to scale back electricity payments and other financial support in an effort to force Hamas to cede ground in Gaza. Abbas is demanding that Hamas hand over complete control of Gaza to the PA, and that the switch be conducted in a single stroke rather than in stages. 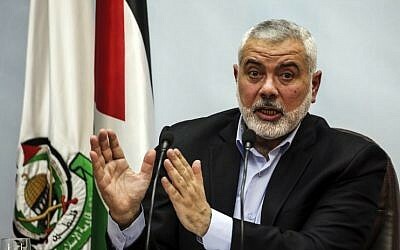 He has warned against a reported deal taking shape between Israel and Hamas for a long-term ceasefire in Gaza if it does not include the PA.
Hamas responded to the criticism with a rare statement slamming the PA and saying that there is a “national consensus” among the Palestinian people in favor of a long-term Gaza ceasefire with Israel. The terror group was referring specifically to a deal that would lift the blockade of Gaza, which would ostensibly require some sort of agreement with Israel.